On Friday, Sept .28, Pueblo’s homecoming was punctuated by a tailgate party, organized by our own student council members. Ms. Sarah Sutton, who is beginning her first year as student council teacher/advisor, started the year off to organizing this huge event. Sutton said, “Everything at Homecoming went well for being my first year of being a part of student council.” She added that she was very impressed by the huge numbers of alumni who showed up for this event. Many clubs participated in the tailgating event, which is a grand opportunity for clubs to raise money for their clubs. Despite a very successful tailgating night, student council admitted that they faced some difficulties in preparing for this event. 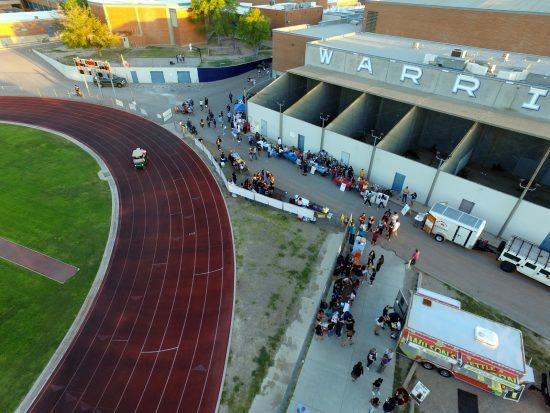 Angella Armenta, secretary for the Class of 2022, has a few suggestions that can help improve Pueblo’s next events. What better way to kick off the fall weather for the Warriors then to blowout the Douglas Bulldogs, after a very disappointing 1-4 losing streak! The 2018 Homecoming game was a perfect day for the Warriors to show the world what they’re actually made of. After losing a few consecutive games, the Warriors practiced diligently to ensure that they had a dramatic and triumphant comeback on the field at this year’s homecoming game. …With a win of 47-0, our Warriors made this homecoming one for the books! The traditional crowning of royalty during homecoming’s halftime definitely brought great anticipation and excitement to the Pueblo community. 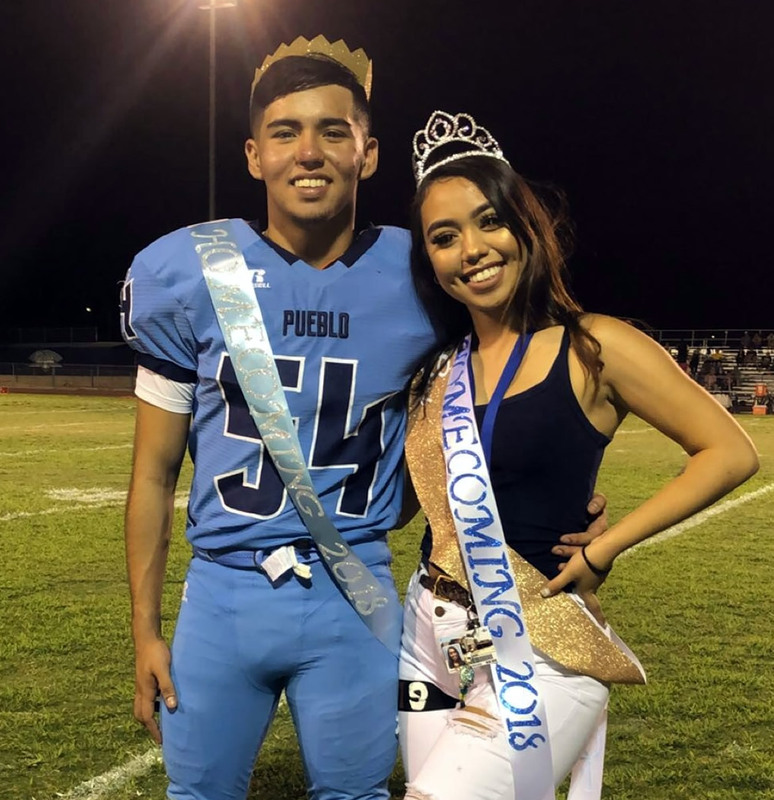 At last, our Warriors finally got to see who they chose for king and queen; this year, seniors King Sam Lopez and Queen Arlie Kontic were named Pueblo’s royalty. Seniors Chuck Hindley and Lulu Pereira were honored to have been nominees, as were Alex Cocio and Renee Olvera. “I was honored to have been nominated for queen,” Pereira said. “Two ‘L’s make a ‘dove’.” She explained that she and Chuck Hindley were prom prince and princess nominees, and we were nominated—but lost—this year. For the first time in recent memory, Pueblo High School held their homecoming dance the day after the actual football game, on Saturday, Sept. 29 inside the South Gym. Actually, this dance almost didn’t happen, but members in the Student Council take the initiative to proceed with homecoming dance plans. For the 2018-19 school year, Pueblo High School’s student government decided to host prom a day after the football game because many wanted a more formal look to the homecoming dance. In past years, students attended homecoming dance directly after the game—usually in jeans and sweatshirts. Although, the dance was not on a traditional Friday, there was a large turnout of over 100 students with an unexpected appearance of a live band, PELT, kicking off the night. Along with the crowd, there was a German presence at his very first homecoming dance. Overall, the crowd was pleased with the great job that the junior class did in hosting the Homecoming dance this year.